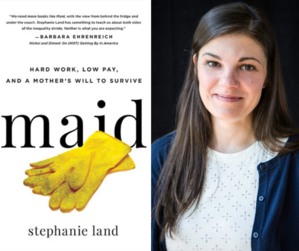 The Wilton Library will welcome Stephanie Land, author of Maid: Hard Work, Low Pay and a Mother's Will to Survive," for an author talk and book sighing on Thursday, Jan. 24 from 7 – 8:30 p.m. Maid is showing up on almost every best of, must read, don't miss list of 2019. We are so fortunate to have author Stephanie Land coming to Wilton Library to discuss this important, timely, and unforgettable memoir. A Q&A and book signing will follow the talk, which is free and open to the public. Books will be available for purchase courtesy of Elm Street Books, New Canaan. Registration is highly recommended. Evicted meets Nickel and Dimed in Maid, about working as a maid, a beautiful and gritty exploration of poverty in America. "My daughter learned to walk in a homeless shelter." Stephanie Land worked for years as a maid, pulling long hours while struggling as a single mom to keep a roof over her daughter's head. In Maid, she reveals the dark truth of what it takes to survive and thrive in today's inequitable society. Wilton Library is located at 137 Old Ridgefield Road in Wilton, Conn. Register online at wiltonlibrary.org or by phoning (203) 762-3950.